The UK's "first dedicated modern slavery support officer" is to be appointed in north Wales. 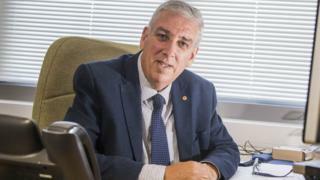 North Wales Police and Crime Commissioner Arfon Jones has made tackling the "insidious" crime central to his blueprint for policing the area. The force said it had helped safeguard 60 victims in the last year. The new officer will provide "unique and never-seen-before" support to victims, Detective Inspector Gary Kelly said. The post is being funded by Mr Jones' office and the successful candidate will be based at the North Wales Victim Help Centre in St Asaph, Denbighshire, which caters for victims of all crimes. Mr Jones said: "Modern slavery and human trafficking are appalling and callous crimes which reach right into our society here in north Wales. He said it was "vital" to increase public awareness to tackle modern slavery. High-profile modern slavery cases in south Wales include one which saw three members of the same family jailed for forced labour offences. Last year, North Wales Police mounted two major investigations into modern slavery, resulting 17 people being made safe. It currently has seven investigations under way, but the force said gathering evidence from frightened victims was "difficult". DI Kelly said: "It is a challenge. The victims can be affected by language barriers and by self-blame and are often people being held under duress or coerced." He said modern slavery and human trafficking in north Wales can often be linked to Ireland with north Wales as a thoroughfare, through the port of Holyhead, to the north west of England. DI Kelly said consumers who "drive into a car wash or visit a nail bar" and "wonder how they can get full valet for £4.50" need to question why. "We need to start asking these difficult questions because there's exploitation taking place here," he added.